The Pellegrini Quartet play Feldman's "String Quartet No. 2"
Pellegrini Quartet (Photo by Matthias Kolodziej) Founded in Freiburg in 1989, the Pellegrini Quartet - Antonio Pellegrini and Thomas Hofer, violins, Fabio Marano, viola (Charlotte Geselbracht, viola, until 1993), and Helmut Menzler, cello - became a leading international quartet performing both the classical/romantic repertoire and contemporary music. They made many CD recordings, including three major recordings of Feldman works on the Hat Hut label: Clarinet and String Quartet (with Ib Hausmann, clarinet) hat[now]ART 157, String Quartet and Orchestra (with RSO Frankfurt conducted by Lucas Vis) hat[now]ART 116, and Violin and String Quartet (with Peter Rundel, violin) hat[now]ART 2-137. 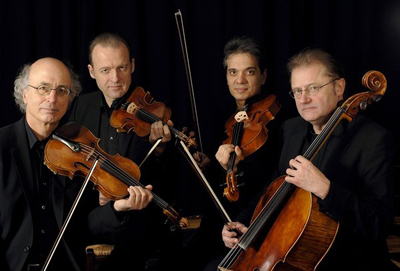 The Pellegrini Quartet first performed Feldman's String Quartet No. 2 in Konstanz on 9 June 2000, and subsequently performed the piece worldwide 15 times. The recording below was made by Werner Praefcke at a concert in Freiburg on 24 November 2000. The recording is made available here by kind permission of the Pellegrini Quartet and Werner Praefcke.